Many's the time I've featured the beautiful Tinkerbots of San Diego's Dan Jones. This time, my eye's been caught by his Hudson Skymaster convertible spaceship, which he added to the Boing Boing Flickr pool. Chiron sez, "I'm making an album and music video on Kickstarter, creating music and art from the most powerful tools human kind has ever discarded. Using recycled electronics, you journey into a secret world, with dollhouse-sized scenes filmed inside technology itself, and sounds made almost entirely out of retro computers & video games. E-waste is a huge environmental problem, and so my mission is to inspire artists and musicians around the world to turn the problem into creative artistic solutions. I've got 13 years professional experience in technology as a senior project manager, and this adventure represents the peak of a 5-year labor of love." Backers pledging to this project can choose rewards, for both people who love listening to music, as well as making it. You can get download and CD versions of the music, and various hardware and software used to make the sounds on the album. This includes software and MIDI hardware for vintage systems, as well as guitar pedals made out of modems and PDP-11 electronics, and art prints featuring scenes from the final music video. Right now there is also a free song and free instruments you can download directly from the Kickstarter page. Everything is designed, built and hand-tested by me and once the project has launched, and after backers get a 6-month head start, I will release everything under an open-source license. Assemblage sculptor Jeremy Mayer (who makes pieces out of deconstructed typewriters) teases us with a single shot of his latest piece: a chihuahua skeleton made from a disassembled, ancient writing-machine. Junkbot kinetic sculpture with mercury-activated action! A group of engineering students (with no stated manufacturing experience -- caveat emptor) are kickstarting a series of cute assemble-it-yourself junkbots called "D.Bug"s. You get a kit full of electronic components, instructions for soldering them into cute robots, and a display box for your complete project. They're on the pricey side ($35 for the cheapest), especially since they don't come with the tools you need to assemble them, but they're a cute and potentially fun entree to soldering and working with electronic components. To assemble the kit, you solder together electronic components to form the body parts of the D.Bug. Easy to assemble!Easy to assemble! The manual includes step-by-step photo instructions, the background story for each D.Bug, a guide to identifying electronic parts, a tutorial for soldering, a harvesting guide for where to find the best parts, and insider tips on how to make your D.Bug look awesome. This spectacular C3PO junkbot assemblage was made by junk artist Gabriel Dishaw, and sells for $800. Worth every penny, too. Mr Dishaw's got plenty of other wonderful pieces for sale, too. 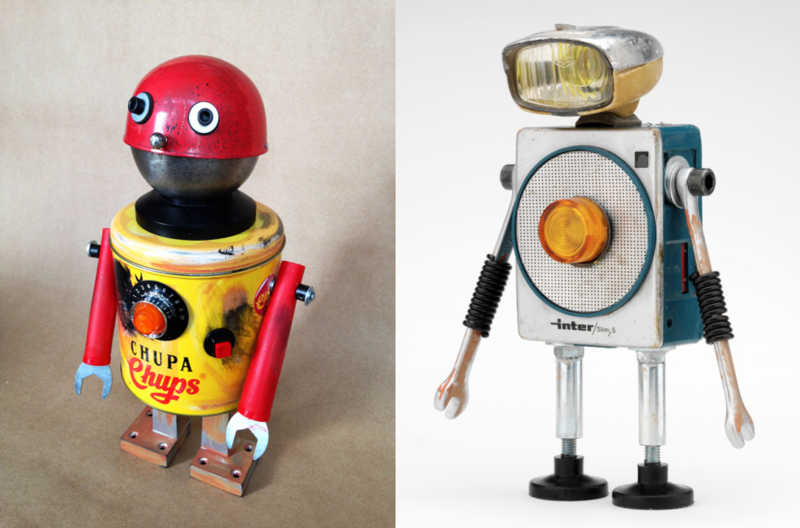 Marco Fernandes's R3bots are absolutely sweet little light-up junkbots made from electronics salvage. They're even poseable! They run about €350 each. Sculptor Jeremy Mayer writes, "This is my latest project- a portrait commission. The client, Mark Pelzner, came to me with 3 typewriters bequeathed to him by his late father, Marvyn Pelzner. Mark wanted me to take those typewriters and make a likeness of his dad that would be mounted on a box which holds Marvyn's ashes. "Marvyn was an Optometrist in the San Francisco Bay Area who was a big San Francisco Giants fan and a doting grandfather. Many thanks to the Pelzner family for coming to me to work on such a powerful and personal project. I feel very fortunate to have been entrusted to do this. As usual, I made this using only typewriter parts- no solder, no glue, no welding, no armature." JM Gershenson-Gates, a sculptor who makes watch-part jewelry, has produced a few watch-part/light-bulb spiders and other crawlies that are nothing short of amazing. He's sold out, but he says he's making more, which is good news for me. The spiders were a huge hit! Mark Oliver's Litter Bug series is a collection of assemble-sculpture insects made from urban found objects and laser-cut metal and wood. They're extraordinarily beautiful -- right up my street. They don't appear to be for sale, and more's the pity. Arthropod sub-species of the Insecta class. A creature whose instinctual and physical qualities have adapted so uniquely to the modern urban environment that it has rendered itself, by nature of camouflage, virtually invisible in it’s normal habitat. When seen in isolation ‘Litter Bugs’ appear to be composed of everyday ‘found’ objects.